Have Voters Killed the Crappy Coverage Comeback? Democrats seized the House while Republicans increased their majority in the Senate, but the unambiguous and across-the-board winner in the election was regulation – specifically, regulation of the health insurance industry. Rarely has the public sent such a clear message that it wanted government to rein in corporations and market forces in favor of consumer and public interest protections. The desire to retain provisions of the Affordable Care Act protecting those with pre-existing conditions was key to Democratic gains. Republicans responded by pretending they agreed with that principle, but few were fooled by this deception. At the same time, voters in three deep red states – Idaho, Nebraska and Utah – approved ballot initiatives in favor of ACA Medicaid expansion. This amounted to an embrace not just of regulation but of out-and-out government-controlled health coverage. All these results should put an end to the longstanding Republican crusade to repeal the ACA, but it remains to be seen whether there is also a termination of the Trump Administration’s effort to undermine the law through steps such as allowing wider sale of substandard policies. The FTC complaint against the companies spells out a variety of deceptive practices meant to make customers think they were buying real coverage when in fact they were getting medical discount memberships of limited value. The ACA’s provisions relating to protection for pre-existing conditions are inseparable from those setting minimum standards for coverage. Ensuring the right of patients to buy insurance is meaningless if they end up with plans that pay for next to nothing. The proliferation of junk insurance through the efforts of companies such as Aetna was one of the dismal realities of the U.S. health insurance market that gave rise to the ACA. Republicans have been promoting similar low-cost plans as their solution to the supposed crisis of Obamacare. This is a cynical ploy to use a perverse form of consumerism to restore the old days of limited regulation. Let’s hope the election results have taught them a lesson about the consequences of messing with healthcare. Posted in Business and politics, Healthcare, Insurance, Regulation | Comments Off on Have Voters Killed the Crappy Coverage Comeback? If Congressional Republicans succeed in enacting either the Senate or the House bill to repeal the Affordable Care Act, they will have carried out one of the most brazen bait and switch moves in the history of U.S. public policy. They and Donald Trump campaigned on the idea that Obamacare exchange premiums were rising uncontrollably, yet neither of the bills does anything to address that problem. They did not vow to repeal and replace Medicaid — Trump, in fact, promised not to touch it or Medicare or Social Security — yet that is what the bills would in effect do, both for the ACA’s Medicaid expansion and traditional Medicaid. It’s been widely noted that the Republicans seem preoccupied with repealing the taxes the ACA imposed on high earners to help pay for the cost of expanding coverage. Yet less attention is being paid to the other giveaway in the bills: the repeal of the ACA’s employer mandate. This provision should be called the Wal-Mart Windfall Act, because it would allow large low-road employers to avoid ACA rules that oblige firms with 50 or more full-time employees to provide health coverage or else pay a penalty. The mandate is far from draconian, yet it was at least a partial remedy for the situation in which millions of workers at big-box retailers, fast-food outlets and similar workplaces were not provided affordable coverage and were encouraged to enroll in programs such as Medicaid. Now the Republicans seek to remove any obligation on the part of employers to provide coverage while also undermining the social safety net alternative. To the extent that the Republicans have a solution to the healthcare problem it is this: bring back junk insurance. It is often forgotten that the ACA was designed not just to address the problem of the uninsured but also the underinsured. Starting in the 1990s, large insurers such as Aetna began selling bare-bones individual policies to low-income individuals who did not get employer coverage and could not qualify for Medicaid. These policies had relatively low premiums but sky-high deductibles and numerous exclusions. In cases of a serious accident or illness, they were all but worthless. The ACA put an end to this predatory market by establishing a set of essential benefits that all plans would have to include. Republicans don’t like to admit that they are promoting a return to crappy coverage, so they dress up their arguments with misleading phrases such as “patient-centered reforms.” Many of them also realized that the idea of lowering standards directly was not very popular, so they have returned to their favorite panacea of giving states more flexibility. This allows them to pretend they are not scrapping essential benefits while knowing that many governors and state legislatures would be all too willing to do so if given the opportunity. The cynicism of Congressional Republicans is matched by that of the big insurance companies, for whom the ACA was tailored and are now doing nothing to defend the law. Instead, they still seem to be sulking about the two anti-competitive mergers (Aetna-Humana and Anthem-Cigna) that were opposed by Obama Administration and shot down in the courts. Having seen their oligopolistic dreams go up in smoke, they now seem to want to give up the ACA market in favor of selling bare-bones policies. It is unclear whether the dystopian vision of the ACA opponents will come to pass, but in the meantime the wellbeing of millions of Americans is being unnecessarily endangered. The ACA repeal-and-replace effort, given up for dead two weeks ago, may or may not be getting resurrected. Whether that happens seems to depend on satisfying the desire of Tea Party Republicans to grant Americans the right to purchase the crappiest health coverage possible. Whereas Paul Ryan and President Trump initially wanted to retain the ACA’s popular provisions on essential benefits and pre-existing conditions, they now seem open to trading them away to win over the Freedom Caucus. The position of the hardliners is often dismissed as some kind of bizarre misanthropy, but it is actually the logical conclusion of the mainstream Republican notion that deregulation is the solution to all problems. That notion has been embraced by Trump, who repeatedly bashes agencies such as the EPA and claims that weakening business oversight is the key to job growth. The members of the Freedom Caucus seem to believe that removing all restrictions on insurance companies will result in lower premium costs. That may be true but only because the insurance that people would be purchasing would cover as little as possible. While the Freedom Caucus presents this as a bold new approach, it is really nothing more than a return to the situation before the enactment of the ACA. Republicans of all stripes would have us forget how awful and oppressive health insurance used to be. Thirty years ago, the House Select Committee on Aging was warning that, in addition to the millions of Americans who were uninsured, millions more were underinsured. As traditional insurance was increasingly replaced by health maintenance organizations — whose business model was to deny as much coverage as possible — subscribers had to fight constantly to get prior approval for many procedures and to get reimbursed for medical fees already paid. 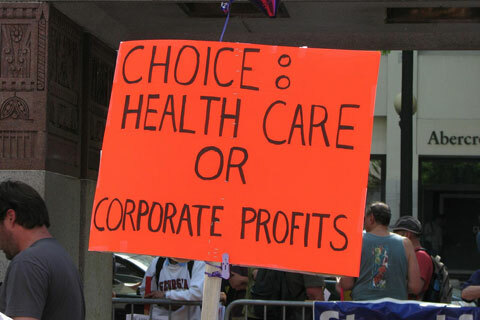 Even worse than the HMOs were the individual plans labeled as “limited benefit” or “mini-medical.” Targeted to lower-income people who were self-employed or had jobs that provided no coverage, these policies could cost as little as $40 a month but they had strict limits on both routine expenses and hospitalization costs. These plans existed for a long time on the fringes of the health insurance world, but eventually large companies such as Aetna, Cigna and UnitedHealth Group entered the market with their own bare-bones offerings. Those subscribing to such plans were gambling they would remain healthy. If instead someone had a serious accident or illness, the plans were useless and often pushed people into personal bankruptcy. Junk policies are the healthcare analogue to payday loans and other forms of predatory lending. They appear to serve a need and initially appear to be inexpensive, but they can have disastrous consequences. The ACA was designed to protect people from those consequences, but the Obama Administration did not do enough to explain the change. In a climate of rightwing demagoguery, many people who had to give up their low-cost junk insurance were led to think they were losing something valuable. Moreover, Medicaid expansion, which provided free, decent coverage for low-wage workers who might otherwise have had to depend on junk policies, was blocked in many states for ideological reasons. Now the Freedom Caucus would have us believe that bare-bones coverage is the way forward for the individual marketplace. That might be the case if we want a society in which those few people with no significant health needs get a bargain while everyone else has to risk financial ruin. During his private-sector career Donald Trump floated many dubious business ventures, and now as president he is pushing his biggest bait-and-switch scheme yet. Having run for office on promises that he would improve healthcare and protect safety net programs such as Medicaid, he is now embracing and promoting a Republican replacement for the Affordable Care Act that would do exactly the opposite. Trump exploited the real frustrations of many people with the ACA — frustrations that were largely the result of Republican intransigence that prevented the inclusion of a public option, blocked any legislative fixes and precluded Medicaid expansion in many states. He implicitly promised that a replacement plan would do more. When Trump stated on February 27 that “nobody knew health care could be so complicated,” he was in effect signaling that the bait phase of his con was over and he was moving on to the switch. Now he has dropped the extravagant promises and has joined the House Republican rush to enact a repeal and replace plan supposedly made urgent by the imminent collapse of Obamacare. The House legislation has not yet been officially scored by the Congressional Budget Office, but it is widely anticipated that it will result in a loss of coverage for millions of people and sharp increases in premiums for many of those who hold onto their plans. Yet there is another issue that is receiving less attention: the quality of coverage for those who remain in the individual marketplace. For now, the Republican plan retains the ACA’s list of essential benefits (preventive care, etc.) that must be included in any individual or small group plan, but it is possible that could be bargained away to placate social conservatives who don’t like the provisions relating to reproductive health. Trumpcare does not, however, include the ACA’s cost-sharing provisions that cap out-of-pocket expenses in plans obtained through the exchanges by persons with income below 250 percent of the federal poverty line. As a result, these people could very well be subjected to sharply higher deductibles and co-pays. This points to the little-acknowledged aspect of the assault on the ACA: at the heart of the Republican “solution” to rising premiums is giving people the ability to purchase lower-cost but substandard coverage. In other words, they want to return to the pre-ACA situation in which insurers could sell bare-bones policies that provided little or no cost reimbursement except in cases of major illnesses or accidents — and might be skimpy in those situations as well. It is significant that Republicans keep quoting Aetna CEO Mark Bertolini in perpetuating the bogus claim that the ACA is in a “death spiral.” Bertolini is hardly an objective observer. He used misleading negative comments about the ACA to try to deter the Obama Administration from its opposition to Aetna’s anti-competitive acquisition of its rival Humana, which was recently blocked by a federal judge who accused the company of dropping out of the ACA marketplace in several states to “improve its litigation position” in the merger dispute. Aetna is also the company that was one of the biggest promoters of bare-bones policies in the pre-ACA period. It got into the business, also known as junk health insurance, two decades ago through the purchase of U.S. Healthcare, an HMO whose bare-knuckles practices Aetna adopted in full and thus found itself the target of a series of class-action lawsuits brought by patients as well as providers. The substandard policies sold by Aetna made up a substantial portion of the plans that were banned by the ACA. The people who had to give up that “coverage” became symbols of the supposed oppression of Obamacare. Although they try hard to hide the fact, Republicans — and now Trump — are setting the stage for a resurgence of the bare-bones policies under the banner of affordability. That will be catastrophic coverage in every sense of the word.